Indo-Japanese relations have always been special. Even during the recent Doklam standoff, it was Japan's envoy to India Kenji Hiramatsu who said there should be no attempt to change the status quo on the ground by force; categorizing the crisis as dispute between China and Bhutan, he said India's actions were in keeping with bilateral security arrangements with Bhutan. 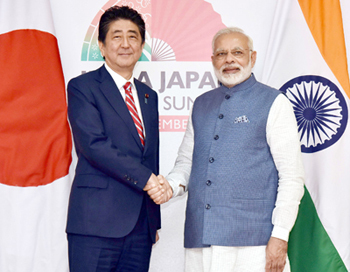 It is in this backdrop that Japanese Shinjo Abe was arriving at Ahmedabad on a three-day visit commencing September 13 for bilateral talks with PM Modi. Prior to Abe's visit, Foreign Secretary S Jaishankar addressing an Indo-Japan colloquium said the India and Japan are set to take their cooperation in civil nuclear and defence technology to the next level, adding, "Japan's openness to supply India with military technology reflects the high-level of confidence that the two countries have developed in each other.... "The growing convergence of views between Japan and India has the capacity to drive Asia's economy and development and stimulate the global growth. ... (we) have agreed to cooperate closely to promote connectivity, infrastructure and capacity building in the regions that occupy the inter-linked waters of the Indo-Pacific. It is obvious that the interaction now has a significance beyond the bilateral. The Asia-Africa Growth Corridor is just one example." The landmark civil nuclear cooperation deal between the two countries came into force in July 2017, having been signed last November during PM Modi's visit to Tokyo. 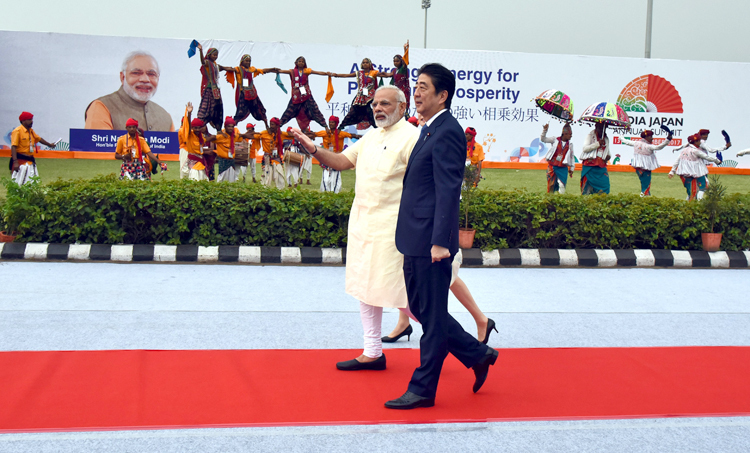 Modi received Abe at Ahmedabad airport on September 13 and both visited the Sabarmati Ashram. The ground-breaking ceremony of the 'high speed' rail network (worth 1 lakh crore) between Ahmedabad and Mumbai was presided over by both Prime Ministers on September 14. Ground-breaking ceremony for infrastructure and industrial projects worth over 25,000 crore was also held, as well as meeting of business and country delegations. Modi and Abe held wide ranging talks. Post signing the joint statement, PM Shinzo Abe said, "We have just signed a joint statement which will serve as a milestone to open a new era for Japan-India relationship... based on that we will strongly promote Japan-India special strategic and global partnership to drive peace and prosperity for Indo-Pacific region and the whole world." Between RIS and IDE-JETRO for promotion of cooperation in research-related activities to promote institutional cooperation. Modi, while addressing a joint press event with Abe, said Indo-Japan ties were not limited to bilateral or regional spheres. The two sides also closely cooperated on key global issues. India and Japan have increased defence cooperation with more bilateral combat exercises, exchanges and collaboration in military and dual-use technologies, in backdrop of increasingly aggressive China. During the recent visit of former Defence Minister Arun Jaitley (before he handed over charge defence portfolio) Japan proposed to field its state-of-art military assets, including the P-1 maritime patrol aircraft with potent anti-submarine warfare capabilities, for the Malabar exercise next year. The two nations will also enhance their cooperation on counter-terrorism, which will include a joint field exercise between the armies of the two countries in 2018. 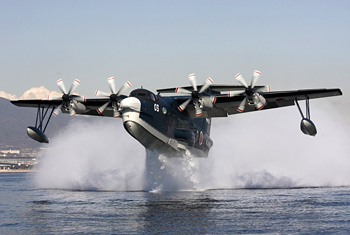 The two countries also decided to begin technical discussions for joint research on unmanned ground vehicles and robotics, as also carry forward the talks on Japanese US-2i amphibious aircraft. If there was any discussion on these issues during Abe's visit, it was kept under wraps. In keeping with 'India-Japan Vision 2025', robust bilateral relations have laid the foundation to expand the scope of cooperation in the Indo-Pacific. It is imperative for both India and Japan to engage in forward thinking to accomplish the full potential of this 'Special Strategic and Global Partnership'. SP's Land Forces was launched realizing the need of a dedicated journal to address the issues pertaining to Armed Forces. Mr George Fernandes, the then Defence Minister did the honor by releasing the first issue. The bi-monthly got popular soon with its extensive updates, incisive analysis diverse perspectives on various issues, interviews & expert views. Today, SP's Land Forces receives accolades from ministry, senior officials, serving officers, PSUs & industry globally.